Who says senior citizens can’t drive? Well, there are statistics on this one, but we won’t go there. The fact is, people change as they get older. Reflexes aren’t what they once were, vision can start to fade, hearing loss can come without notice, and everyone younger than you thinks they know everything. As a wise man once said, don’t get old if you can help it. If you’ve hit the age of retirement and haven’t skipped a beat in any of these areas, kudos to you! However, if you’re staring truth in the face, driving a car can be one of the areas that once seemed extremely easy, but now comes with some degree of difficulty. Fortunately, there are cars out there that can make life a little easier on you. We’ve researched Car and Driver, Consumer Reports, Edmunds, and Motor Trend to find them for you, and here they are…the best cars for senior citizens. 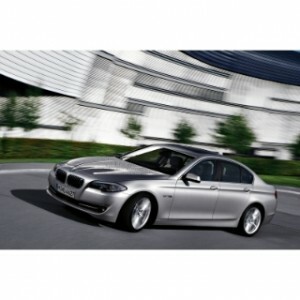 The BMW 5 Series seems as though it were actually designed with senior drivers in mind. Even the lower models, such as the 528i, are not short on power, but possess a comfortable suspension and active steering that makes handling much easier. A lowered windshield makes visibility easier for shorter drivers, and it sits lower than the BMW X5, making it much easier to get in and out of. The seating is extremely comfortable and there is enough legroom in all four seats to accommodate riders well over six-feet tall. If you opt for the 528i or 535i, you’ll also get a very respectable fuel efficiency from the 3.0L six-cylinder engine at 22/32 mpg (city/highway). If you’re retired and looking to finally treat yourself to a bit of luxury at an affordable price, look no further than the Hyundai Genesis. Fuel efficiency (18/27 mpg from the 3.8L V6) doesn’t quite match that of the BMW 5 Series, but in terms of luxury it comes as close as possible without having the blue-and-white propeller emblem on the hood. The soft ride and light steering are comparable with vehicles costing twice the price, and the sound insulation makes the Genesis remarkably quiet. It also received one of the highest crash test marks of any sedan, earning five stars in the government’s new 2011 standards. The 5-year/60,000-mile warranty is the clincher. If you’d like to carpool or take the grandkids for ice cream, but don’t want the inconvenience of climbing into a minivan, the Flex is your best option. Its boxy style provides great visibility from all angles, but there is an available rearview parking camera to assist with backups whenever necessary. Fuel economy from the 3.5L V6 is in the range of 17/24 mpg with front-wheel drive and 16/22 mpg with the all-wheel option; this isn’t too bad for the size vehicle the Flex is. When you’re not playing bus driver for everyone, the rear seats can lower and increase cargo area to 83 cubic feet. The power-folding mechanism in the second-row seat makes getting to the third-row extremely easy. The second row also features optional captain’s chairs to provide an added sense of comfort for all passengers. 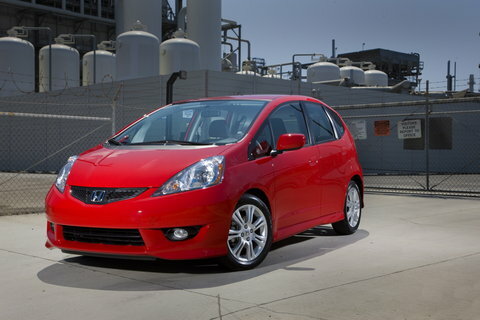 If you’re looking to stay in the economy sector and don’t mind going a little small to do so, the Honda Fit is a perfect choice. Despite its tiny appearance, it actually possesses quite a roomy interior. Cargo capacity can increase to a whopping 57.3 cubic feet. This is comparable to many crossover SUVs. 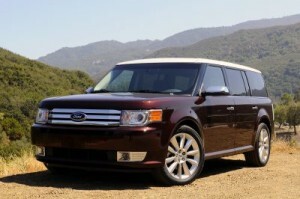 Its sharp steering and peppy 1.5L engine make it fun to drive but not overly engaging. It also features the best fuel efficiency of any car on this list at 27/33 mpg. The diversity of the rear “Magic Seat” really must be seen and tried out as there are few words that can describe its ambidextrousness.